Tag Archives for " Don DeLillo "
Linchpin will likely not be the last book Seth Godin publishes in a traditional way. If you live primarily inside the echo chamber of the online marketing world you’ve undoubtedly heard that Seth Godin, author of at least 12 books that we know of, has pulled the plug on the publishing industry by proclaiming that he no longer intends to publish books the way they are traditionally published. You can get the full story on Seth’s blog, from MediaBistro and even the Wall Street Journal. Now, before I go any further it must be stated that I am a fan – I am inspired by Seth’s writing and have been blessed by his support on more then one occasion. We have the same publisher and he was kind enough to write testimonials for the jacket of both my books. He is the real deal and has a following that any business or business person would envy. But, let’s keep this in perspective. This is not the end of traditional publishing as we know it, it’s not even the end of traditional publishing as Seth knows it. Business books, and sadly marketing books, make up a very small chunk of the book publishing world, but even inside this rather small bubble, this is simply a statement that content consumption has evolved. We know that, we’ve all responded to that, but more than anyone else I know Seth has a knack for clearly stating the things we’ve all been standing around thinking – some may not agree, but that’s a skill set that turns people into thought leaders. Business book writers don’t really have to be that good at writing. I include myself in that last statement. I don’t think my publisher cares so much about what I can write. They do care deeply about what I can sell. That’s the reality that irks some, but it’s a fact. I have no idea if I’m a good writer or not – although three or four pages into a Don DeLillo novel and I realize how terribly inappropriate it would be call myself an author – but I love that people are inspired to action by something I’ve figured out how to put on paper – the digital and print kind. Not that the world is waiting for me to weigh in, but I do intend to continue to publish in the traditional sense because I still enjoy it and think that the majority of content consumers enjoy it as well. Seth Godin can afford to move to non-traditional forms of publishing because he has access to traditional forms of publishing and distribution. If you’re a book buyer, you are going to stock Seth Godin’s next hardback. If you’re a world class book editor, you’re going to enjoy editing Seth Godin’s next book. 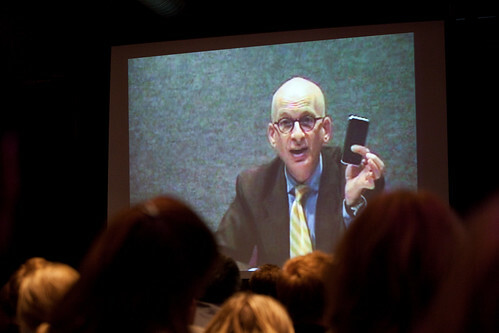 Seth Godin actually stands to make more money from a book he can self publish because he has the platform to do so. This move makes sense and is not a completely bold or trailblazing one. But, let’s wait and see when it hits the shelves. The Wall Street Journal article cited above states that Linchpin has sold roughly 50,000 copies. That’s a nice number, that’s a number that gets you Wall Street Journal and New York Times Best Seller status in the world of business books. Jonathan Franzen has a new book coming out next week. (Yes, there’s a Kindle version) His last book sold 2.85 million copies and I’ll bet the majority of business book fans couldn’t name it. So, before we go off and do away with the traditional print and distribution models understand that more than anything else, Seth wants to have a conversation with his fans and if he has something to say, you can bet he will generously say it in as many forms as are deemed necessary. Perhaps the biggest winners from the buzz of Seth moving on are the self-publishing industry and authors without a sufficient platform to attract the attention of a Portfolio.